I think my favorite part of Cartagena, besides taking photos near colorful walls and murals 😉 was spending time with my friends Hillery and Adrian. I came to Colombia a day after my grandfathers funeral, so I wasn’t quite in the greatest head space. But I was still determined to go on this trip. I knew that my grandfather, of all people, would have wanted me to go on this trip no matter what! And so off I went. It was so nice to spend time and catch up with Hillery, who is a great college friend and someone that I am truly lucky to have in my life! I had just met Adrian, and heard all about him, and must say, he was a ton of fun to travel with and SO easy going which was awesome! 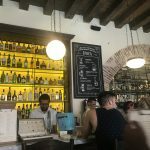 More about my trip and mushy feeling stuff later, but on this post I’m really going to focus on what I did in Cartagena! 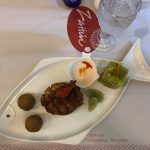 Hotel: Originally, we had planned to stay at the Alfiz Hotel. 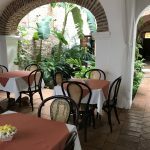 I must say, if you are a couple on a honeymoon or just a couple in general, this hotel is SUPER romantic, in a great location, the staff is very accommodating, and the hotel is beautiful and very traditional Colombian. 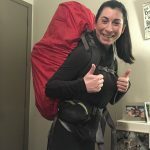 However, for the 3 of us youngin, backpackers, this MAYBE wasn’t the right choice and we ended up moving to a hostel down the street. 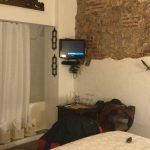 I must say, even though I mostly prefer Airbnb’s and hotels to hostels, the hostels in Cartagena were pretty nice compared to ones that I have stayed at in Europe and the Middle East. I maybe wouldn’t have picked the one we chose, but it worked and it was in a great location! Walled City: Almost everything you need to go to is located in the Walled City, with the exception for the beach and Getsemani and you can walk pretty much anywhere from there. 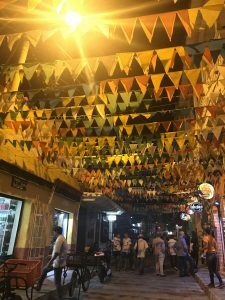 Getsemani: This neighborhood is filled with awesome restaurants, hostels, and has a great vibe to it! On the weekends, the squares around there are filled with people dancing and singing and there is a ton of street food. Beach: So, there are mixed reviews when it comes to the beaches there. During my stay, we opted out of a beach day, but only because when I drove by, it didn’t look like a very appealing beach, which is why I would have liked to visit another city while I was in Colombia. Zaitun: $$$ I went here on my first night in Cartagena. I loved the decor of the restaurant and the food was pretty great as well! I started off with the humus plate, and while it definitely wasn’t your traditional humus, I thought the flavors were great! For my main entree, I ordered fish with avocado salad and fried plantains. It was absolutely delicious and filling. The only think I didn’t like about this restaurant was at the end of the meal, they make you fill out this survey and ask you to fill out a trip advisor review. It made the restaurant feel REALLY touristy to me, and that put a bad taste in my mouth. They also have people with menus on the outside of the restaurant soliciting people to come in. That is always a red flag in my book, but luckily, the food and atmosphere made up for it! Demente: This was probably one of my favorite restaurants that we went to! They are well known for their pizza’s, which looked delicious, but we actually didn’t eat that while we were there. Instead, we indulged in a ton of tapas, each of them unique and delicious! My favorite ones were the tuna tartar, meatballs, and the potatoes. 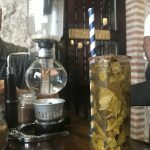 I also loved the vibe of the restaurant, it was very dark, modern, and industrial, and it was in my favorite area, Getsemani. La Paletteria: $ this little popsicle store is great and definitely provided much needed heat relief on a 100 degree day! There are a ton of flavors and they all looked pretty tasty! I had the cheesecake one, and while it didn’t exactly taste like traditional cheesecake, it was still very tasty! I definitely recommend this place! OhLala: $$ Ohlala was definitely my favorite breakfast find! 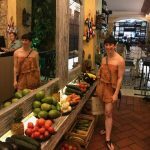 This restaurant is made for instragram! I mean it! It’s so quaint, with its white and purple high ceilings, and cute displays everywhere you look! The food was pretty good as well and not too expensive. Epoca Cafe: $$ If you enjoy coffee, which I don’t, but my friend does, you should DEFINITELY go to this cafe! The way they brew your coffee in front of you is an experience in itself and I heard that the coffee was incredible! I had a unique cocktail that was made out of cocoa leaves. It was probably one of the most beautiful drinks I had ever seen and it tasted pretty great too! Alquimico: $$ If you enjoy a great cocktail, a rooftop bar, and/or an awesome ambiance, then you should definitely try Alquimico. I would say this was my favorite bar that we went to and it had an awesome vibe and fantastic drinks. Highly recommended! El Baron: $$$ El Baron was a great place to have an elaborate cocktail while sitting outside and admiring the views and people watching. The drink itself was quite small for the price, but it was delicious and incredibly unique. I definitely recommend this place to grab a cocktail and people watch! Cafe del Mar: For an INCREDIBLE views of the ocean and Cartagena, go to Cafe del Mar! Good drinks, great view, and a great place for a group of people to hang out! The two things I would have done differently is 1. Taken a 2 day trip to another island or to visit Medellin. I heard their beaches are amazing! 2. Go to Bogota! I have heard that it is an awesome and vibrant city! I think I would have loved it! 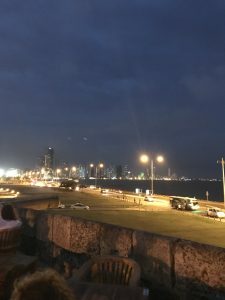 Cartagena was a vibrant, walk-able city, that had a lot of charm and good food. I recommend not staying more than 3 nights and if possible, taking a 2 night trip to other cities in Colombia. 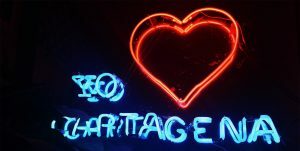 If you like coffee, food, walking a lot, taking photos with colorful walls 😉 and a vibrant nightlife, than Cartagena is for you!